Imagine this scenario…it’s been a long day at work and you come home to a full mailbox. You’re tired and thinking about dinner as you sift through the envelopes. Which ones are junk mail and which ones are important? Can you tell right away? Now think about how your company’s envelope would look in that stack of mail. What does it say about your company? Does it make a good first impression? 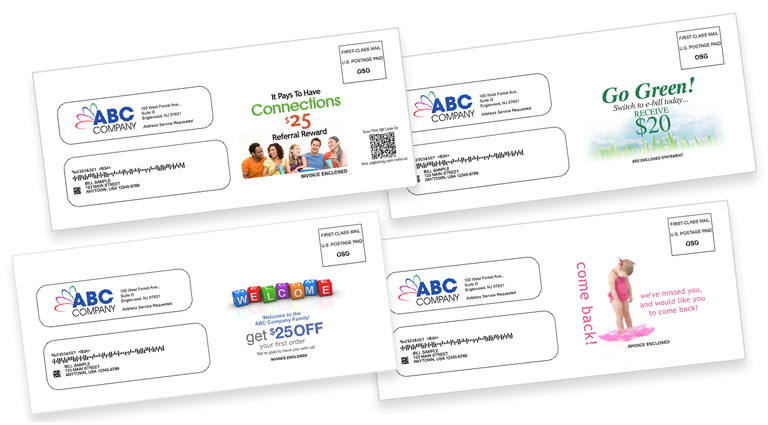 According to a Xerox study, 69% of people are more likely to open mail with color text and graphics than a plain envelope. Those are pretty good odds that using color will direct your customer to your envelope first. As the first point of contact with your customer, use color to make a good first impression and encourage them to see what is inside. This is your chance, right from the start, to create a compelling invoice or statement package. Use color on your envelope to unify all of the pieces of your package together by tying-in your dynamic message and your insert to reinforce your communication. This is a great way to boost your cross selling and up-selling potential and maximize your marketing efforts.